In an effort to return to regular sewing after Quilt Market sensory overload, I made 6 more Liberty nine patches yesterday. So I thought it was time to see how all my blocks look together. This warm and cool arrangement was what I was sort of planning to do when I began this project. It seems to lack something, however. It might just be the bad light of late night photos or the fact that I need more cool blocks to even the numbers some, but I was less than enthusiastic. My instagram friends suggested a more balanced alternating arrangement of cool and warm colours so I rearranged. Although the instagrammers like this one, I am still not sure. I did not make the blocks with this in mind (the darker and lighter squares of each block cannot alternate all the time in this arrangement, but perhaps that is more interesting anyway), and this seems so chaotic to me. I have some more ideas this morning for layouts and clearly I am going to need more than a 5 x 5 set of blocks. Luckily I have a lot more Liberty scraps, although this process has made it clear that I have far more warm colours than cool ones. I'm going to try to take some daytime photos and I'll share more on this with you soon. If you have layout thoughts, more ideas are most welcome. Congratulations to all our winners! I will email you shortly. 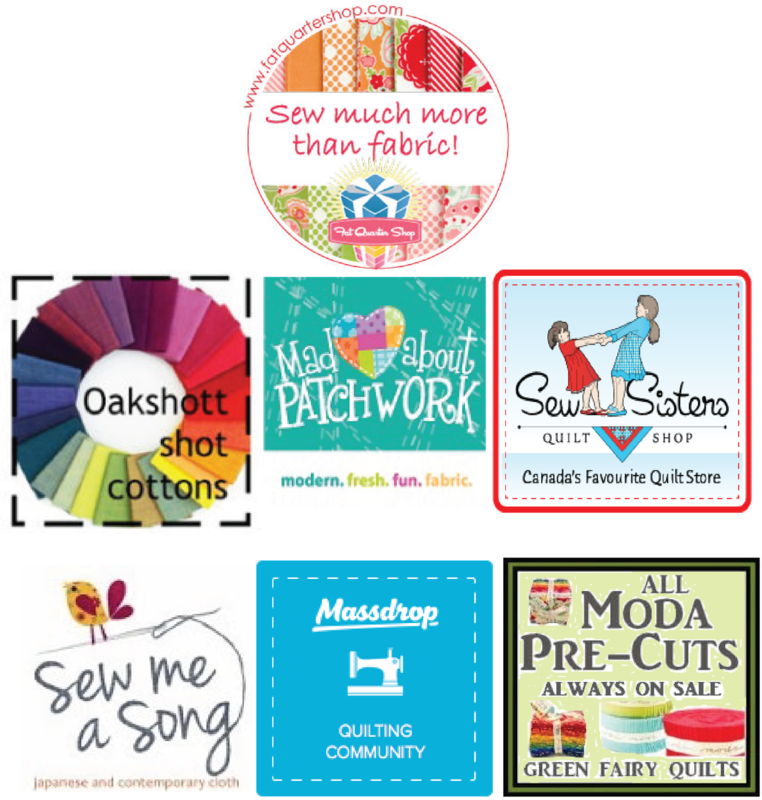 Please plan to join Nicky from Mrs. Sew and Sow for the June Scraptastic Link Up on the second Tuesday in June (June 9, 2015). 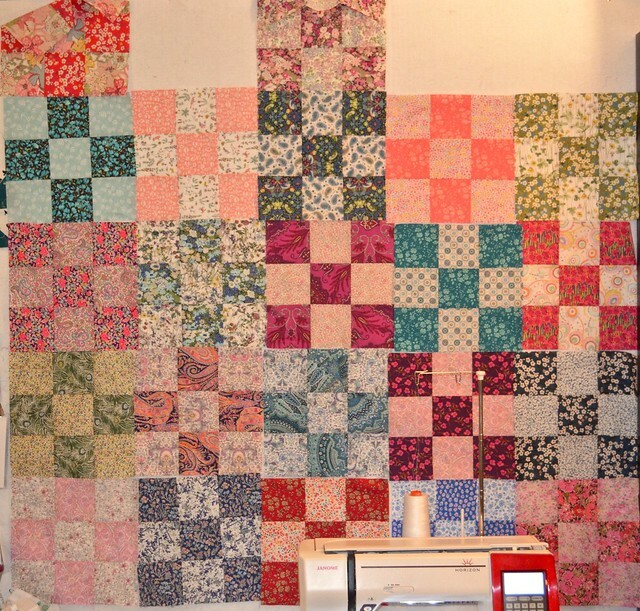 I see that Nicky is showing off her quilting on her latest scrappy masterpiece today - I love this particular quilt a great deal - this morning, go and take a look. And although she has hinted that I will share about Quilt Market, I am not quite ready to put my thoughts down on that, watch for that later this week. I like 9-patches - keep playing with layout and I think you will find a happy. Thank you for the win - a lovely birthday present. I can't say that I've laid out a comparable quilt top, but when I look at your nine patches, I see, depending on the block, either the X emphasized or the +. Perhaps if you separate your blocks into two piles -- the Xs and the +s -- and alternate them in the layout you'll have the contrast you need to make it work. (I hope that makes sense!) Good luck! What about getting a few more brighter blues in there? Two of the cool blocks have some very vibrant ones but the rest seem muted. I love the warm/cool layout! Perhaps you could have the cools running corner to corner on the quilt with the warms on either side. Then you could use more warm colors without it looking lopsided. I think it is going to be great! I think the problem is Liberty overdose. I would try alternating with solid colour blocks and perhaps make it all cool or all warm. The photos/light aren't the greatest so I'm not sure what colour solid I would suggest. Maybe a surprise deep, intense colour to add a bit of wham. Or you could go delicate, with a whisper shade of pink or peach. Probably don't use Kona, but a softer solid fabric--maybe a voile--or go wild and get some Liberty plain lawn, or similar. How bout' on point with a plain block between? Or just on point but add a few more darker shades like that great burgundy-purple one. This is the part of quilting I love - playing with it till it yells...YES! Have fun!!! I like the cool dark arrangement as well , but I think it needs more cool colours and you have more warm. But I do have to admit I tend to prefer cool colours as a rule. 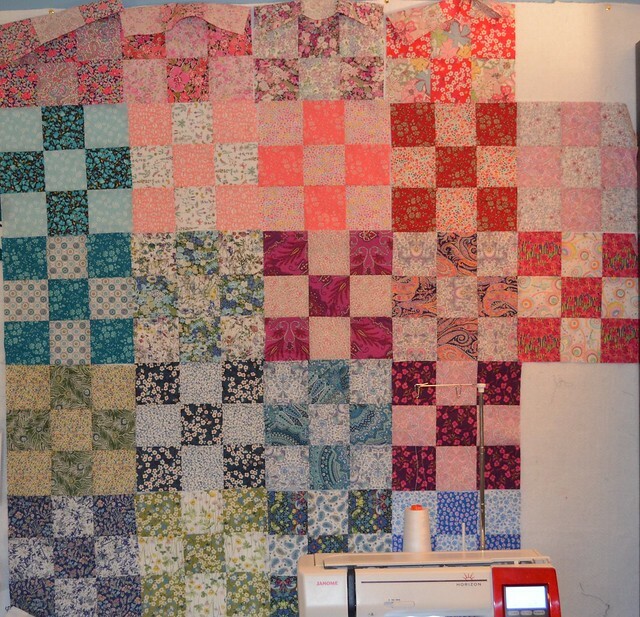 I think with this type of quilt, the more blocks the better and things will all start to fall into place. Maybe you want to keep it purely Liberty and scrappy but maybe you could alternate the blocks with a solid? A shot cotton might provide a lively counterpoint even a grey shotcotton? Glad you can get in some Decompression Sewing after Quilt Market. It's theraputic to make a repetitive block for me, too. A friend summed up my life now as compared to before. "Your decisions in your last job were serious decisions in people's lives. Emotional responsiblities. Now you wake up, and think, 'Wow, what COLOR do I want to use today?'" Love this friend, and needed perspecive to realize how important just uncomplicated sewing is to heal me. I think you have a great start, and I don't for a second believe in Liberty over dose - there can't be such a thing. I do think that some more bright greens and yellow would add some tension and interest, and also introduce some of the really dark liberty prints. Good luck and keep us posted. OH.... i see at the back of your Janome, you've got a tall thread (cone) holder. I have the same Janome, is this cone holder a separate accessory to buy - or did it come with your machine??? A jam jar and a safety pin (the latter sellotaped to the back of your machine so you can thread the thread through it) should work just as well as a spool holder and is far cheaper! P.S. Prize claimed and spent - thank you!